Osaka is a haven for people who love food. You can find all of Osaka's delicious food, as well as delicacies from all over Japan, in the famous shopping district of Dotonbori. Let us take you on a food tour of this area! Dotonbori in Osaka is the perfect place to enjoy shopping as well as delicious food! However, surrounded by the humongous shop displays and the inviting scents wafting from everywhere, it might be hard to choose which delicious treat to try first. In order to help you out, we will introduce you to the top five local delicacies to try when in Dotonbori. Takoyaki, which are fried octopus dough balls, are one of the most famous street foods originating from Osaka. Dotonbori is lined with many shops selling this tasty snack. 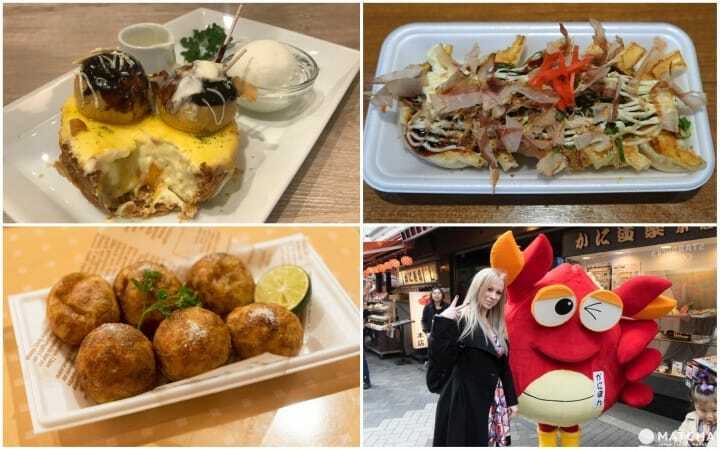 In fact, this abundance of takoyaki restaurants also leads to really unique creations in order for the shops to stay competitive. This takoyaki is topped with truffle salt instead of the typical takoyaki sauce and mayonnaise combination. It is served with a slice of lime. You can sprinkle the lime over the takoyaki to give them a more refreshing and less salty taste. I recommend trying your first one or two pieces without the lime as the truffle salt is divine by itself. After this, sprinkle the lime juice over the takoyaki to get the full flavor experience. Onsen tamago (hot spring egg) takoyaki is another of the many unique creations I tried. It might not look like there is any takoyaki in this dish but you will discover it after digging through the layers of leeks, mayonnaise, and the melty soft-boiled egg. This combination makes for a very juicy takoyaki dish with many textures. It is also not too heavy because of the thick layer of fresh leeks on top of the takoyaki. Both versions are available at CREO-RU in Dotonbori. If you are a little bit more adventures you can try odoritako (dancing octopus). A whole small octopus is used in each piece of this takoyaki. The legs are sticking out so it looks like the takoyaki is dancing. Odoritako is available topped with takoyaki sauce and mayonnaise or with simple soy sauce and mayonnaise. You can also order a mix of both which you can see in the picture above. Since there is a whole small octopus inside every bite, this takoyaki offers a squishy and chewy sensation at the same time. It is rather different compared to normal takoyaki. There are two odoritako shops in Dotonbori - one along the main street and the Hozenji store which is located on a side street. I recommend going to the Hozenji store as it tends to be less crowded. If you have ever been to Dotonbori, you probably know that it is famous for its large and flashy shop displays. One of those displays, which showcases a set of oversized gyoza (fried dumplings), belongs to the restaurant Osaka Ohsho. Osaka Ohsho offers all kinds of Chinese cuisine but is especially famous for their delicious gyoza. If you order their Osaka Special Gyoza, you will receive six crunchy gyoza with typical takoyaki toppings such as takoyaki sauce, mayonnaise, leeks and bonito flakes. These toppings and the fresh gyoza go quite well together and if you love takoyaki, you should definitely give the "Osaka Special" a try. Osaka is the birthplace of kushiage, fried skewered food, which can be found everywhere in Dotonbori. The word "kushi" refers to the stick, while "age" means fried in Japanese, so the word basically means fried things on a stick. It is also referred to as kushikatsu, which just means meat cutlet on a stick. Kushiage does not only consist of meat, so calling it kushikatsu might be misleading. Vegetables, different types of meat, cheese, and even cookies, fruit, as well as mochi (glutinous rice cakes) can be enjoyed battered and fried in the kushiage style. One of the most popular kushiage restaurants in Dotonbori is Kushikatsu Daruma but there are many different restaurants around the area. Each place offers different variations of this popular dish, so I recommend trying kushiage at more than just one place. Just remember the golden rule: no double dipping into the sauce! Picture taken from Okonomiyaki Tsuruhashi Fugetsu - Osaka Comfort Food With A Great View! Okonomiyaki is an essential part of Osaka cuisine. It is probably the most time-intensive food introduced in this article because you have to sit down and either make it yourself or watch it being prepared for you. If you want to enjoy it thoroughly, you should definitely plan to stay at the okonomiyaki restaurant for at least an hour. Picture from Okonomiyaki Tsuruhashi Fugetsu - Osaka Comfort Food With A Great View! Many different okonomiyaki restaurants are located around Dotonbori. Tsuruhashi Fugestu is a restaurant loved by locals and visitors alike and one of its many restaurants is located in Dotonbori as well. Besides okonomiyaki, they also offer other delicious local Osaka food such as yakisoba (grilled noodles) and tonpeiyaki (an Osaka-style omelet). Would you like to try a local sweet treat? If yes, consider visiting Pablo's only cafe in Japan. Pablo is a famous cheese tart maker in Japan with its origins in Osaka. The cafe is located right beside the famous Osaka bridge connecting the shopping districts Shinsaibashi and Ebisubashi. You can find the cafe on the second floor with the first floor being a Pablo shop where you can buy souvenirs and take-outs. This is the only place where you can enjoy the Pablo Takoyaki Mini Cheese Tart. Filled with creamy cheesecake, the tart has a melty gouda cheese center. It is topped off with mini cream puffs drizzled with chocolate, vanilla sauce, and powdered matcha green tea to make it look like takoyaki. The cheese tart will be served with thick honeyed mascarpone sauce and vanilla ice cream. It might be called mini but it is rather filling, so I recommend sharing it with someone if you want to eat more than just this cheese tart in Dotonbori. Enjoy the Food Haven Dotonbori! Naturally, Dotonbori has much more food to offer than just the five samples I introduced to you here. You can find all kinds of food - from Osaka specialties and Japanese favorites, all the way to food from outside of Japan such as Chinese cuisine. Why not explore the amazing food of Dotonbori next time you visit Osaka? 15 Fun Things To Do In Osaka - Both Famous And Little Known! 10 Things To Do In Shinsaibashi And Dotonbori To Have Fun In Osaka! Take A Stroll And Snack In Osaka's Senbayashi Shopping Street!